The timeline after the Magi left Bethlehem is uncertain. 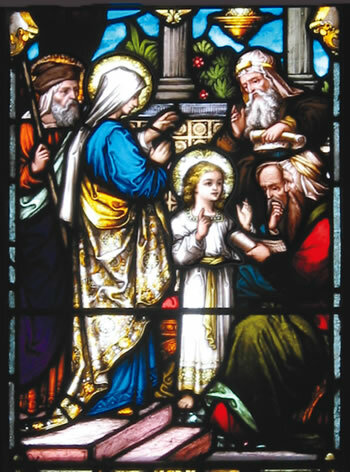 Jewish law required Jesus to be circumcised at 8 days and be presented in the temple after 31 days, and Mary could be purified 40 days after Jesus’ birth. Luke’s gospel records Jesus’ circumcision, when He was named, then His presentation in the temple in Jerusalem, presumably after 40 days because Mary was there. 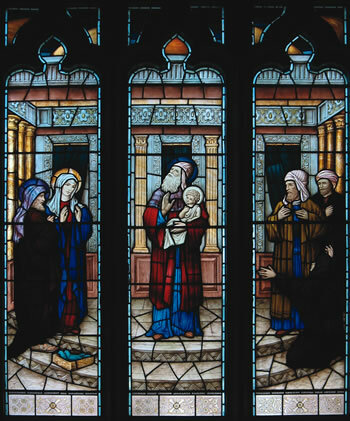 Matthew’s account of the flight to Egypt would appear to take place immediately after the Magi departed, which seems to conflict with Luke’s account of the Presentation. However, it may have been some time before Herod realised the Magi had evaded him, and his edict that all children up to 2 years old should be killed means the flight to Egypt should be placed after the Presentation. and finally Jerusalem in the background beyond the curtain in the temple. I wonder how Mary felt as Simeon prophesied? 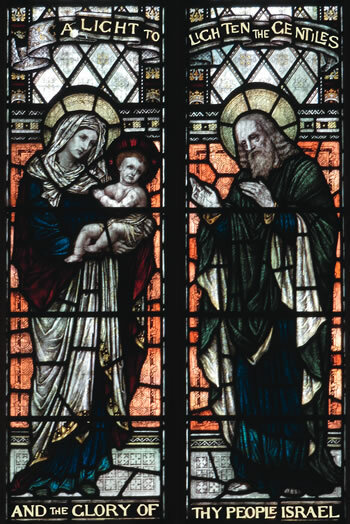 The window in All Saints, Palmerston North  restricts itself to Simeon’s prophesy, and shows the very strong faces that are typical of the designer Brunton. The doves are there, and Jesus looks plump for 6 weeks old. 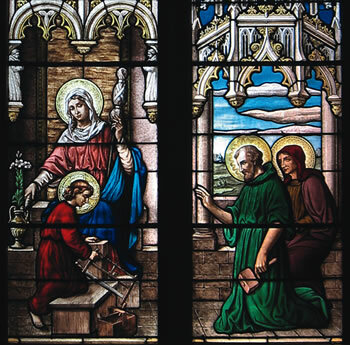 The beautiful depiction in the Cathedral of St Louis, Blois, France  has an idyllic image of Mary, and Joseph is holding the required sacrifices. The only thing missing is Jerusalem. Two of the windows on this page have been included for interest. The one in St Andrews, Vancouver, Canada  shows a very pristine and highly decorated temple, with the two men on the right looking on - scribes, possibly. Another in Eglise St Malo, Dinan, France  is very colourful and over-detailed, typical of windows I saw in Brittany. 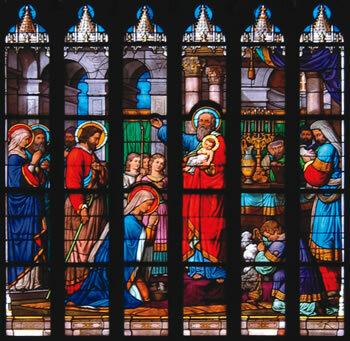 Space does not permit a larger view of the window, but there is an altar boy incensing the baby in the bottom right of the window, choir girls above Mary, church officials on the right. 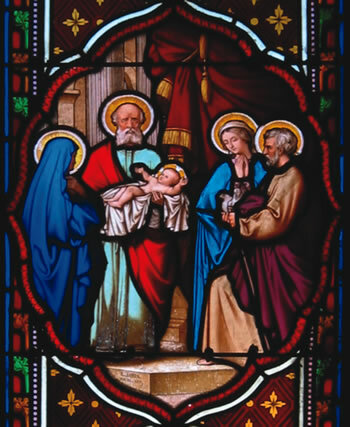 The much older window in Wells Cathedral, England  shows part of Simeon’s prophesy and includes only Mary and child. The background is of a lead-lighted church rather than in a temple in Jerusalem, and Jesus is much older than 6 weeks! Joseph took Mary and the baby Jesus to Egypt to escape Herod. In those days, that meant travelling on the back of a donkey carrying the child. I have seen very few windows depicting the scene, and they are all very similar. 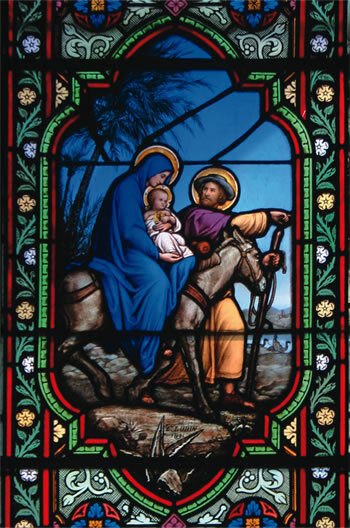 Typical is the one in Our Lady of the Sacred Heart, Randwick, Sydney  showing a tired-looking Mary with Joseph on foot in the middle of the desert. Note the camels in the distance! Luke records the time when Jesus was twelve years old and His parents had a breakdown in communication and left Jesus in the temple in Jerusalem after the Passover. How worried Mary must have been when they realised He was missing. After three days they found Him there, astounding the teachers. Mary, quite rightly you would think, took Him to task and He responded by telling her that she should have known He would be in His Father’s house. But she didn’t understand his response. 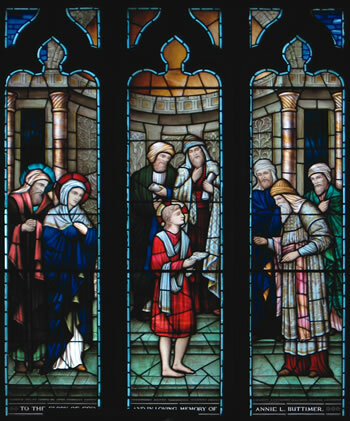 As this incident in Jesus early life is so well known, there are many examples of it shown in stained glass. Here are two. 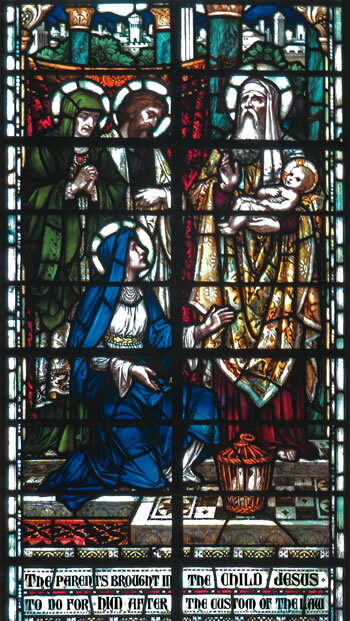 The window in St Patrick’s Catholic Cathedral, Armagh, Northern Ireland  seems to me very expressive of how Mary must have been feeling when she found her child, although the boy Jesus looks very feminine to me. The other  is from St Andrews, Vancouver. Harking back to  in the same church, you can see that they were designed by the same hand. The detail is exquisite, the boy Jesus more realistic than the girl-like image in . Luke refers twice to Jesus’ upbringing. He states that He became strong and wise, and God was pleased with Him and so were the people. And “His mother kept on thinking about all that had happened”(Luke 2:51). 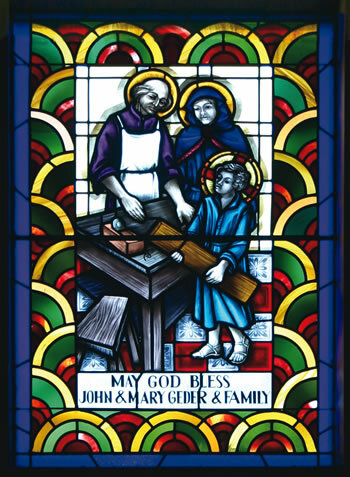 There are some windows that show Jesus in Joseph’s workshop, and in most of them Mary is present, looking on proudly. Here are two examples, both part windows, from Holy Rosary Cathedral, Vancouver  and St Josephs, Enfield, Sydney .